State-of-the-art war movie from director Ridley Scott, based on the US military blunders which took place in Somalia in 1993. Following a series of attacks by warlord Mohamed Farrah Aidid on a Red Cross distribution centre, a group of US Rangers are sent on a mission to capture two of Aidid's close associates in the capital city Mogadishu. However, after successfully apprehending their targets, the Americans come under heavy attack from the residents of the city. 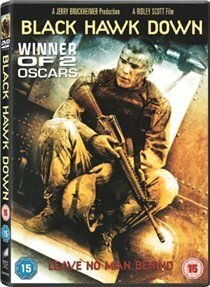 In the ensuing chaos, a US Black Hawk helicopter is shot down, and the surviving crew find themselves trapped in a confused and relentless shooting battle with the enemy.